Every year at my party one dish appears. And that's a basic terrine of Foie Gras (served either with thin toast made from pain de mie, or small brioche, this year it was the former). The reason why I always serve this dish is that it was the original reason for my birthday bash. When I turned 30 I was asked if there was something that I wanted to do, and my response was that I wanted to try making foie gras and maybe have some folks over to share it with. Of course, you really can't just serve foie gras, and so things started to get a bit out of hand, and before too long the party as it stands today was created. First, you clean two whole Grade A foie gras livers (that ends up being about 3 pounds worth, depending upon the ducks that year). Cleaning basically involves "breaking" apart the livers and following any connective tissue and blood vessels. These are edible, but make the presentation less than attractive (in fact, you can see that I missed one large one this year). This is the most time consuming and (at first) scary bit. Foie is unusual to work with and in the back of your head you keep thinking about how much money you are handling. I wear latex gloves for this process, for two reasons. It helps you avoid slipping when cleaning the foie, and also you don't contaminate the livers (because this does get cooked very little). After cleaning, slice any still very thick pieces into "planks" no more than 1/2 an inch thick. You proably won't have too many like this. Toss all of the cleaned parts into a large work bowl and toss around with some salt, pepper, and a splash of cognac. Allow to rest in the fridge while the oven heats to 250. Layer the prepared foie into a terrine mold. Mine is about 10" x 3" x 3", and the two foie lobes will fill it just to the top. Between the layers, you can nestle wedges of black truffle (I used two lines of truffle this year). If using truffles from jars (which are all you can get most of the time and what I normally end up using) add any packing liquid to the foie in the bowl as well. Place the mold into a pan filled with boiling water, you want to come up the sides about half to 3/4 of the way. Place entire pan into the oven and let cook for around 20 minutes. I usually check at around 15 and I think this year ran for about 25. You want to see pooling of the fat on the top of the terrine, but don't want to actually end up cooking the foie for very long, or you will have nothing left. While the foie is cooking, gather up any scraps or bits from the cleaning (including any blood stained bits of foie you removed) and place into a small pot. If you have any really large pieces, you can save them for something like a seared foie dish. However, as I mentioned, two lobes basically fill my particular terrine pan. Heat over medium low heat until you have rendered out all of the fat possible. Strain this fat into a clear glass vessel (so you can see any bits that end up at the bottom). Reserve. When the foie is done, remove pan from oven, and remove terrine mold from the water bath. Allow to sit 5 to 10 minutes to cool slightly. Place the terrine mold in some other metal pan that you will be able to fit into your fridge (I use disposable half hotel pans for this). Loosely cover the terrine mold with two layers of plastic wrap, and place some kind of flat pressing device on top of the foie (I use a 1/2 inch thick board cut to fit inside of my terrine mold that I then wrapped in many layers of foil). Bring the sides of the plastic up over the pressing device, and place some heavy object(s) on top. I use two large cans of tomato sauce most of the time. You will notice/be horrified as huge amounts of fat flood out of the terrine mold and over the side. This is OK. Press down on the top (more fat! oh no!) until you are certain that the foie has been compressed well. Place the entire mess (pan, terrine, plastic, board, and your weights) into the fridge. Leave for about an hour, or until you are certain that the fat has completely set up. At this point, remove the terrine mold from the under-pan, scraping down any fat from the outer surface, and any that has stuck to the plastic. If any foie meat has crept up the sides during pressing, cut that off and add to the under-pan. Place the under-pan on medium-low heat and melt down the fat. Strain into the glass vessel you used to hold the reserved fat from above. If needed, re-heat the fat until it is all melted. Pour the fat over the surface of the terrine, making sure to coat the entire surface. Do not pour any cooked bits or non-fat, you want a pure yellow fat layer only. The fat will seal the terrine and keep it in good condition for a long while (I have no idea how long, but I'm pretty sure it's months). Once coated, wrap the terrine mold in several layers of plastic wrap (this is mostly to keep the greasy outer surface from making a mess) and place into the fridge. Leave at a minimum overnight, however I make my terrine 5-7 days before the party. To serve, remove the terrine mold from the fridge about 10 minutes before you are ready to serve. Run a sharp knife around all four sides several times. Turn the terrine mold over and give a good shake over a cutting board. The foie should come out in a single block. If it doesn't come out, repeat the knife around the edge and try again. Remove the layer of fat (it should easily separate from the foie) and reserve (this can later be melted and strained to be used as a cooking fat, particularly nice with potatoes or for roasting a chicken). 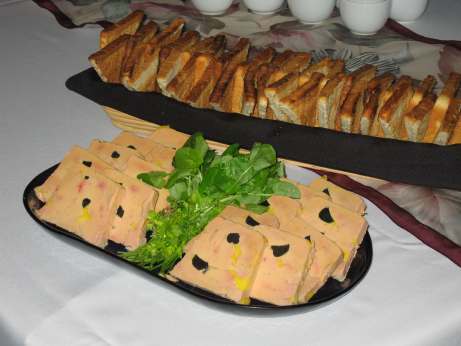 Slice terrine and arrange on platter.